In this article we'll take a closer look at this update. You can also scroll down to watch a short video. There are four main categories in the menu, in addition to the ‘Official Journal’: ‘EU Law’, ‘EU case-law’, ‘National law and case-law’ and ‘Information’. When accessing a document, the tabs previously displayed at the top of the text (Text, Document information, Procedure, National transposition and Summary of EU legislation or Summary of Case law documents) are now accessible on the left of the text. This menu is dynamic, it travels when scrolling down the page to read the document. Searching for documents remains mostly unchanged with the availability of the familiar features: Find results by, Quick search, Advanced search, Expert search (for signed in users only). The site is now mobile friendly, so adapting to the size of the device's screen. EUR-Lex will soon be getting a new look and feel to offer you a better user experience regardless of whether you are a regular or occasional user of the site. All your favourite features and functionalities will still be there. In this video we will go through the main parts of this update. The website will have a lighter look, which means that each page will be built around its main features. Let's start with the homepage. The homepage will offer our key features and functionalities with one click. You will find the ‘Quick search’ at the top of the page. You will still be able to access the ‘Advanced search’ via the link displayed directly below the ‘Quick search’ box. Our information box will be displayed directly underneath. On the right side you will be able to access the daily Official Journal and the dedicated Official Journal pages. Below the Official Journal we have placed the ‘Find results by’ box boxes — one for document number and one for CELEX number. In the centre of the page you will find our new menu, which will quickly help you to understand how the information is organised on the site and where to look for certain pages. There are four main categories in the menu, in addition to the Official Journal: ‘EU Law’, ‘EU case-law’, ‘National law and case-law’ and ‘Information’. On any other page apart from the homepage you will be able to access the menu via a button just below the EUR-Lex logo. Additional menu items directly connected to the page you are currently viewing will be placed on the left-hand side. We have moved the links that were previously available in the left- and right-hand columns. ‘Summaries of EU legislation’ can be found under the category ‘EU Law’ in the menu. ‘How to link to us’, ‘Types of documents in EUR-Lex’, ‘Predefined RSS feeds’, ‘Webservice registration’ and ‘Online tutorials’ will now be available in our ‘Help’ pages. ‘Budget’ and the ‘Legislative drafting guide’ will be available under ‘Links’ at the bottom of each EUR-Lex page. ‘N-Lex’ will be found both under ‘Links’ and in the footer together with the list of other sites managed by the Publications Office. ‘Latest developments on EUR-Lex’ and ‘News’ will be available in the menu category ‘Information’. ‘EU legislation on statistics’ will be available in ‘Statistics’. The ‘Newsletter’ will be moved to the footer at the bottom of the page. You will be able to register for or sign in to your ‘My EUR-Lex’ account by clicking on the user icon in the top right corner on any page. When you search for documents you will still be able to use all of your favourite features: ‘Find results by’, ‘Quick search’, ‘Advanced search’ and ‘Expert search’, which is available for signed in users only. The search results page will look almost exactly the same — we have only updated the design. Once you open a document you will notice that tabs that were previously displayed at the top of the page are now on the left of the text. This menu is dynamic, which means that it will travel with you when you scroll down the page to make it easier to access the tabs. Lastly, the site will be mobile friendly, so you can be sure that EUR-Lex will adapt to the size of your device's screen. If you have any questions please don't hesitate to get in touch via ‘Contact’ at the bottom of each page. You can also watch the video directly on YouTube. 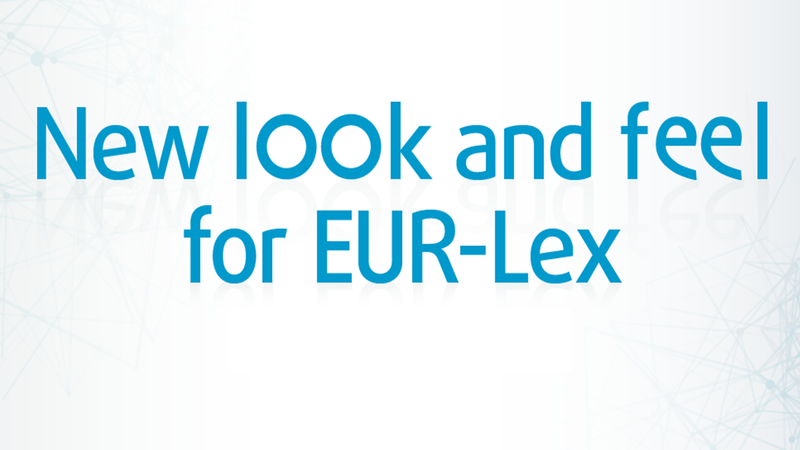 EUR-Lex will soon have a new look, updated features and easier navigation. The way you navigate around the website will be clearer, with an easily accessible menu. We’ve also improved how you access and read documents and information related to them. For example, the home page will have a cleaner look with five categories in the navigation: EU law, EU case-law, national law and case law, information and dedicated access to the Official Journal. The search functionalities will remain the same as in the current version. You will also still be able to access any documents and searches saved in your account. The website will be mobile-friendly.